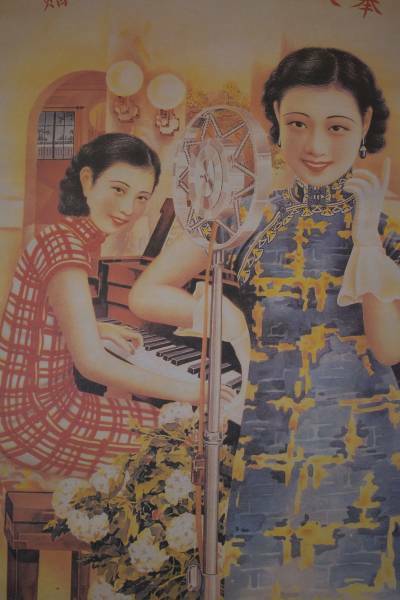 A poster from 1930s Shanghai. It was just an old, dusty trunk in a Mumbai warehouse – one that EMI was cleaning out prior to its demolition in 2003. The trunk had Chinese writing on it, and inside was a treasure: the mother-shells (from which 78rpm records were made) of 800 songs recorded in Shanghai, mainly during the 1930s, in a style called shidaiqu: a blend of jazz and Chinese folk music. This discovery led to a CD release of some of the songs, and that, in turn, has resulted in the creation of a cabaret show, Shanghai Mimi, based around the material. Hunter was presenting La Clique in the Famous Spiegeltent at Auckland Festival in 2007 when he first heard it. “Auckland central city is now about 40% Chinese,” he says. “So I was putting up advertising, and I was thinking, “The people just outside the door are not going to come through the door, because it’s not for them. '” He discussed the dilemma with the show’s director, David Malakari, who agreed that they didn’t know how to attract that audience. Then he gave Hunter a copy of the shidaiqu CD, and for the producer the pieces immediately fell into place: the Spiegeltent, 1930s jazz, acrobats, perhaps, and “a show that would be accessible to Chinese and non-Chinese audiences in equal numbers”. In the event the world premiere of Shanghai Mimi for Sydney Festival takes place in Riverside Theatre instead, which Hunter thinks works even better, with the aerialist acrobats having a higher ceiling with which to work. Playing the fictional Shanghai Mimi is a New Zealand-raised, Melbourne-based singer of Chinese parents, Sophie Koh, a Triple J Unearthed beneficiary, who sings in both Mandarin and English. She’s joined by dancers, acrobats and a quintet, although the focus remains very much on the music. With its potential appeal for both Chinese and non-Chinese audiences, Hunter now has wider international ambitions for the show. “The inner city of most major cities now has a newly-arrived middle-class Chinese diaspora,” he points out. Shanghai Mimi: Riverside Theatre, January 10-20.